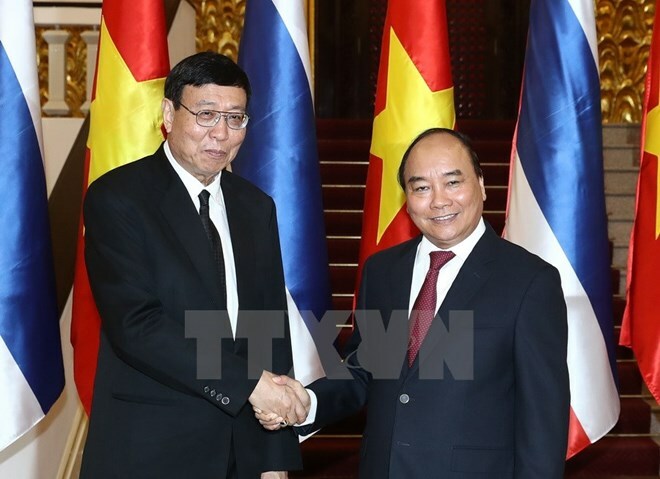 Hanoi (VNA) – The official visit to Thailand by Prime Minister Nguyen Xuan Phuc from August 17-19 is expected to deepen the two countries’ relations in various fields such as politics, security, defence, economics and trade. Vietnam and Thailand established diplomatic ties in 1976. Since 1991, the bilateral rapports have strongly developed, especially after Vietnam’s engagement in the Association of Southeast Asian Nations (ASEAN) in 1995. Particularly, Vietnam and Thailand elevated their relations to “strategic partnership” during the visit to Thailand by Party General Secretary Nguyen Phu Trong in June 2013, becoming the first two nations in ASEAN to set up “strategic partnership”. The two countries later signed an action programme to implement their strategic partnership in the 2014-2018 period on the occasion of the official visit to Vietnam by Thai Prime Minister Prayut Chan-o-cha in November 2014. Through regular delegation exchanges, Vietnam and Thailand have approved and carried out a number of bilateral cooperation mechanisms, notably the joint cabinet meeting, the joint committee on bilateral cooperation, and the deputy foreign ministerial-level political consultation. Given the establishment of the ASEAN Community in December 2015, the countries’ leaders agreed to enhance coordination to strengthen ASEAN solidarity and cooperation as well as promote the central role of the bloc in addressing regional and global issues. Trade and investment activities are considered a spotlight in the bilateral sound relations. Two-way trade has continuously increased in recent years from 5.78 billion USD in 2009 to 12.5 billion USD in 2016. As of April 2017, the bilateral trade reached 4.3 billion USD, a year-on-year rise of 21.5 percent. Two-way trade is expected to top 20 billion USD by 2020. Thailand is ranked 10th out of the 116 countries and territories investing in Vietnam with 458 valid direct investment projects worth nearly 8.2 billion USD, mainly in the fields of processing and manufacturing industry, trade, and agro-forestry-fisheries. The two countries have also developed cooperation in other realms such as defence-security, transport, agriculture, labour, culture, and tourism along with anti-environmental crime, military aviation, navigation, and marine patrol. They continued strengthening coordination with Laos and Cambodia to expand roads connecting Thailand, Laos and Vietnam and marine routes linking Thailand, Cambodia and Vietnam in the coming time.